A few years ago, while I attended my first C2E2 comics convention, I made the mistake of wandering through the dealers’ room. I was able to withstand the temptations of the cool clothing, books, and collectibles. I avoided the posters, and the original artwork. But then I passed a leatherworks booth, and stopped. So many lovely things. I wound up buying a rustic shoulder bag in a rich cognac shade. I also bought a notebook. Whip-stitched, ruddy brown, with an ornate hook-and-eye closure and paper that appeared handmade. I’ve never written in it. Every so often, I page through it, and ponder the possibility of using it. 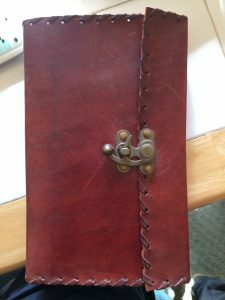 But I fear spoiling those roughened silk-like pages with scraps of dialogue that will likely never be used, or notes that will never be formed into a story. 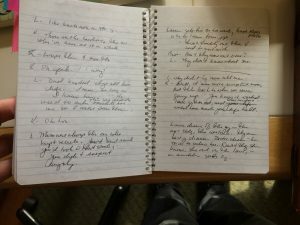 I would want anything I wrote in that notebook to stand the test of time. I would want it to mean something. Moleskine* notebooks. I know folks who buy them by the pack and use them to the exclusion of all others. Some time ago I splurged on a three-pack, which rested unopened on a bookshelf until one day I finally tore off the cellophane. I use one of the notebooks as a mileage log, but the other two remain unused. Blank. Clean. 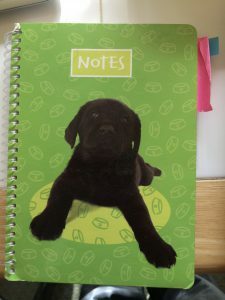 Cheap notebooks, on the other hand, get filled up pretty regularly. They’re the medium that holds so many messages, the story notes, lists, doodles. Maybe it’s because they’reinexpensive, so I don’t min d filling them with words that may never go anywhere else. 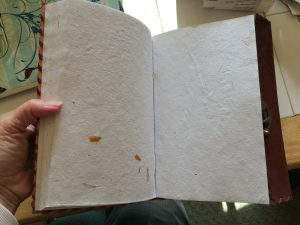 Maybe it’s because the pages are often removable, so that at any given time, I can tear out all the used ones, and have a clean notebook again. Another fresh start. Still, I like to think that someday, I will grab a pen and make that first mark in one of those special notebooks. They say that you can’t enjoy a new car until it sustains that first ding or scratch. Only then does it become something that you can sit in comfortably and drive. Maybe after I write that first line or sketch that first flower, they will become like any other notebook. A tool, nicer than some, but a tool just the same. Do you own something that you love but have never used? If so, do you think you’ll always keep it pristine, or will you finally wear it, or use it, or make that first indelible mark? *I confess that the name puts me off. In my mind, I delete the ‘e’, which leaves me with the odd notion that the covers are made from mole pelts. Next → Next post: My ConFusion Schedule!